I would like to introduce you to the genus Proboscidea. 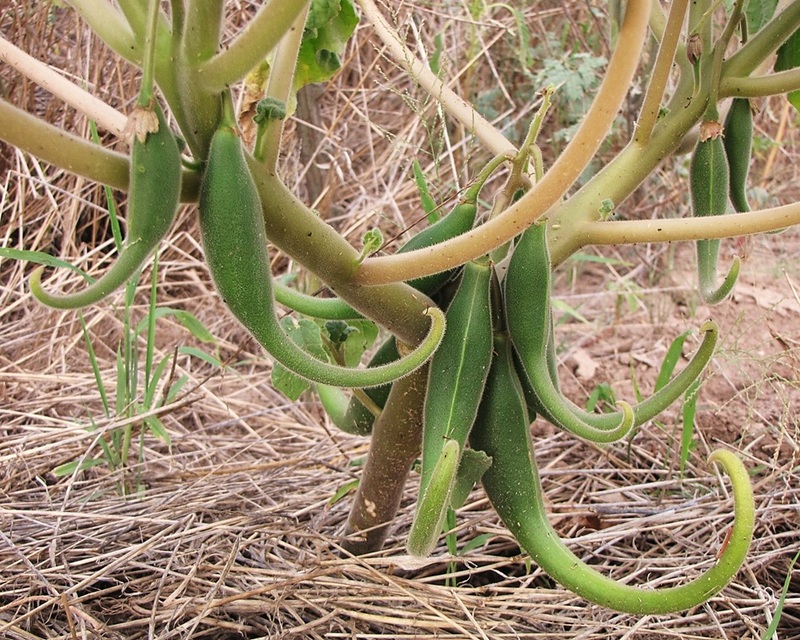 These lovely, albeit sticky plants are collectively referred to as the Devil's claw plants. The common name comes from the nasty looking seed pods which likely evolved in response to large mammals that once roamed this continent. The genus Proboscidea has traditionally been placed into the sesame family (Pedaliaceae) due to superficial similarities in flower and seed morphology, but more recent work has moved it into the unicorn plant family, Martyniaceae. That's right... unicorn plants. The entire family is found in the New World, with two species (P. lousianica & P. althaeifolia) hailing from arid parts of the southern portions of North America. At least two other species are readily naturalizing in this region as well. There are some aspects of these species that make them quite interesting to botanists. For starters, the apt name of Devil's claw was bestowed upon this genus because of the bizarre seed pods they produce. Similar to burs, they can become entangled in fur quite readily. The odd thing about this seed dispersal mechanism for some Devil's claws is how big those seed pods are. Until cattle were introduced to this continent, animals large enough to effectively disperse these massive seed pods seemed to be missing, having gone extinct at the end of the last ice age. It is believed that these plants may be an anachronism of this era. The flora we are familiar with today spent millennia co-evolving with ice age megafauna like mammoths and giant ground sloths. There is a growing school of thought that many close relationships probably developed over this time and have not yet been lost due to the relatively limited amount of time since the extinction of these large mammals. There are some people who will tell you that the seed pods are "designed" to ensnare small mammals like mice, causing them to die, which then provides the seeds a nutrient-rich, rotting corpses on which to germinate. I have never been able to find any evidence in support of these claims. Another intriguing anatomical feature of this species are the countless sticky glands that cover the entire plant. These readily ensnare insects that land on or try to climb up the plant. Analysis of the fluids secreted by these glands show evidence of digestive enzymes but the jury still seems to be out on whether or not Devil's claws are undergoing any active carnivorous behavior. It is more likely that these glands are a form of defense against insect herbivores and indeed they work quite well. Even a brief run-in with this plant leaves you quite sticky and slimy. It is possible that by ensnaring herbivorous insects, the plant can attract carnivorous insects that will eat the herbivores and then "repay" the devil's claw with nutrient-rich feces. Another possibility is that the glands cause the plant to become covered in sand grains over time. Such sandy armor would get in the way of hungry herbivores. To ad insult to injury, the plant kind of smells. It has been likened to old gym clothes. These are neat plants. I have had fun growing them in the past. They are an annual but may reseed if care is not taken to removing the seed pods before they pop open. Because of their lively appearance and the unique look of their seed pods, these plants are often grown as horticultural oddities. Be careful though, as they have escaped cultivation outside of their native range and can be considered a noxious weed!